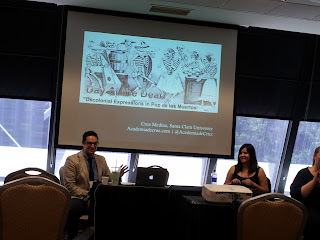 This past weekend, May 26-28, I attended the national conference of the Rhetoric Society of America (RSA), where I presented a paper on Day of the Dead/Dia de los Muertos decolonial expressions in pop culture such as The Book of Life and George Romero's Dead series. This research came from my chapter in The Routledge Companion to Latina/o Popular Culture , edited by Frederick Aldama. RSA was a great opportunity to connect with new colleagues and reconnect with old friends (so many University of Arizona grads, alums and profs). I was lucky enough to have a couple colleagues from Santa Clara there with me. 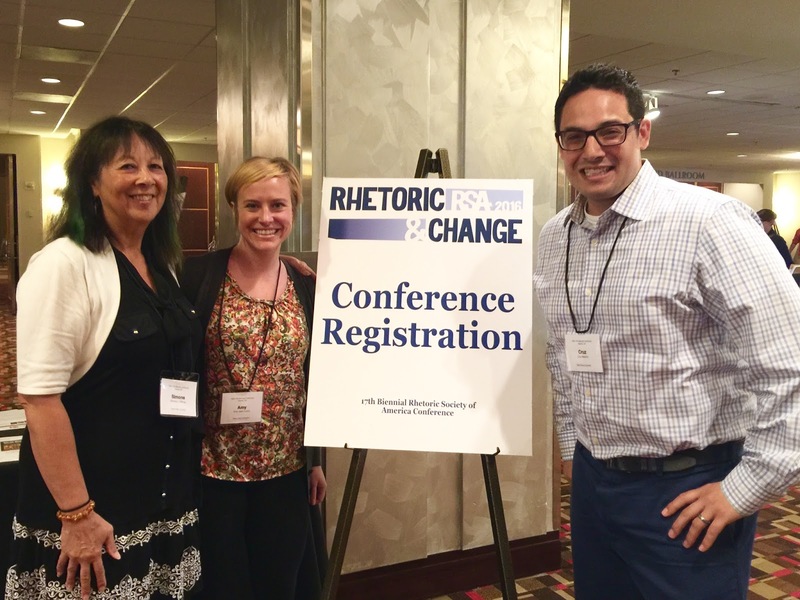 Simone Billings and Amy Lueck presented, attended functions for researchers at Jesuit institutions, and took part in the research network forum. 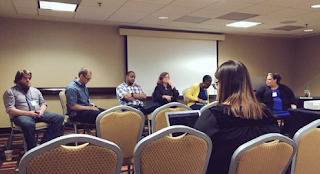 I attended a roundtable talk of researchers from Jesuit institutions discussing the collection Traditions of Eloquence: The Jesuits and Modern Rhetorical Studies , which addresses issues of eloquentia perfecta, spirituality and Jesuit pedagogy. Steve Mailloux spoke of eloquentia perfecta as a good person speaking and writing well for the public good, and how to revise core curriculum with this in mind. I also attended a talk by Joseph Bizup, whose BEAM framework for research I use in my writing courses. Bizup spoke about his recent collaborations with librarians and how writing teachers in library research are often characterized by their one-off sessions with librarians; Bizup outlined ways that he discusses the channels and genres for purposeful research. David Green and Ersula Ore spoke on the rhetoric of gun violence surrounding the Charleston AME murders, discussing the inequality of how gun violence is distinguished when the shooter is white (mental illness/video game blame) versus Black shooters (assailant/perpetrator). Ore reflected on her experience, concluding with the assertion that she did not have the authority to 'stand her ground' as Zimmerman claimed for fear of Trayvon Martin. In a panel featuring Tamika Carey, Elaine Richardson (Dr. E), Gwen Pough, and Eric Pritchard, Carey laid the groundwork for the roundtable, Pritchard spoke on the rhetoric of African American fashion, Pough discussed 'Afro-pessimism,' and Richardson advocated for finding ways to affirm one another. Richardson advised not to get caught up in the struggle of the struggle and explained that all lives will matter when Black lives matter. I also caught the second-half of a great talk by Christina Cedillo and Melissa Elston on "Indigenous Bodies and the Corporeal(ized) Rhetorics of Empire," where the role of re-creating 'authentic' Native American representation was deconstructed as re-enforcing pioneer narratives of conquest. I presented with Miriam Fernandez, a PhD Candidate at Washington State University, who presented her paper "Mothers of Conquest: Reclaiming the Matriarchal Figures of Latin America." Miriam outlined the role of nationalism and myth in Mexico while introducing examples that disrupt binaries about female sexuality with regard to the Virgin of Guadalupe. I really appreciated the insightful discussion that followed. Jose Cortez acted as informal respondent and got the Q and A session going with some good thoughts and questions about 'what can be decolonial?' 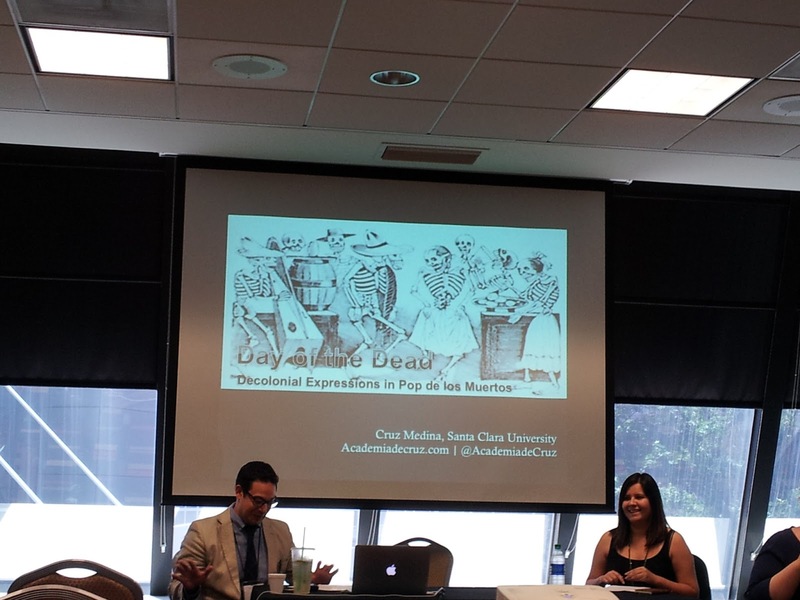 Christina Cedillo raised some questions about the ethical use of decolonial knowledge once it leaves the hands of the community that created it, and Karrieann Soto spoke to the parallel work of decolonial projects that happen in the diverse sites across Latin America, the Caribbean and US. 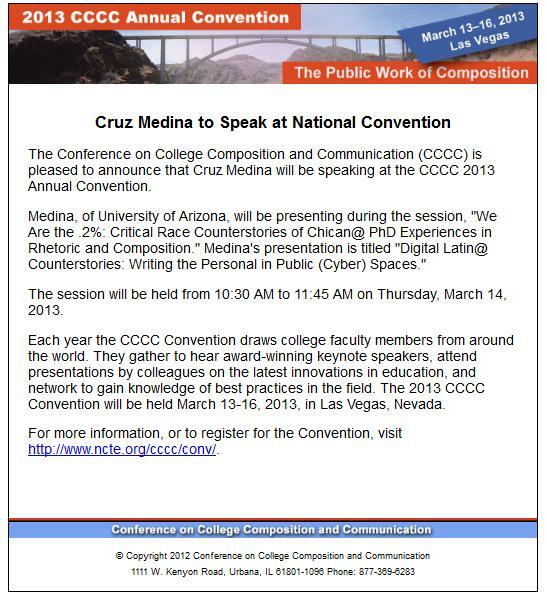 Thanks for sharing your conference experience. Inspiring!